100914 is rated 2.0 out of 5 by 4. Rated 1 out of 5 by French2 from Jegs Pro-Flo 200 Stainless Steel Braided Hose -06 Very poor quality. Finally deemed it useless due to the fact that no matter how I cut it, the fraying made it impossible to get into the fittings. Your tech suggested that -06 is just difficult to work with, and suggested buying a "LOADER TOOL" which I did, but to no avail. Finally gave up and purchased a name brand hose and have not had any problems. I was trying to save a little money and ending up costing myself twice as much. Live and learn. Would not recommend or ever purchase again. 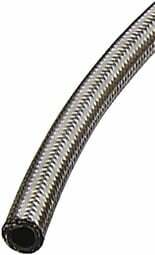 Rated 1 out of 5 by Oldmanchevelle from Stainless steel braided hose DO NOT PURCHASE THIS PRODUCT.! We've tried many ways to cut this hose without the " ends" fraying. i.e. Chop saw, dremmel tool, cut-off wheel, 4 in. Grinder, using, duck tape, hose clamps, ty-wraps etc. No way can you get a fitting on the darn hose. The quality is severely lacking. Rated 1 out of 5 by Loyal Jegs Customer from Spend the extra money on quality hose. I bought this for a budget build and not satisfied at all. No matter what method I used to cut the line I could not stop the end from fraying, making it impossible to put a hose end on. The ends always fray a little on any hose but never seen it this bad. What&rsquo;s the pressure rating for this hose? The rating will be 500/750 psi. How fire resistant is this hose? This will withstand most flash engine fires, as long as they do not last very long. Can this be used with power steering? This hose is not compatible with any power steering system. Our equivalent part number to this size and length, that is power steering compatible is 555-104913. It must be used with PTFE specific hose end fittings as well. Will this work with transmission fluid? This is acceptable to use for transmission fluid. No, this hose can not be used with Push Loc hose fittings. You must use the Push Loc hose. Will this hose and your Jegs AN fittings support the Holley Sniper EFI for supply and return? Yes, these will work very well with any of these systems. Can I used this hose with diesel fuel ?